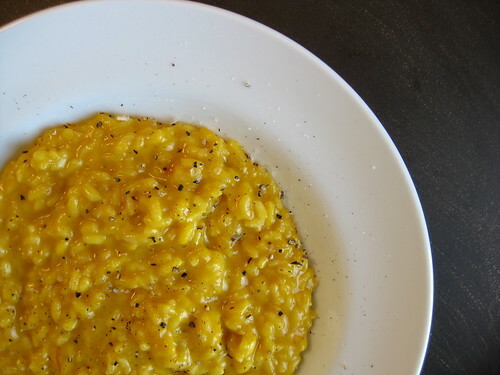 When I opened up my Twitter feed the other morning and saw a tweet from the recipe hunters over on NoshOn.It about a pumpkin risotto with Taleggio, I was sold. Taleggio is one of my favorite Italian cheeses — I’m a sucker for soft, washed rind varieties — and I’m always looking for ways to use up a partial can of pumpkin pureé. With a few tweaks to my old standby basic risotto recipe, I had a very fall-appropriate, super creamy rice dish ready to be devoured. So creamy, in fact, it’s almost like having a bowl of mac n cheese. By using a generous pinch of saffron, the orange hue of the pumpkin was markedly enhanced — as was the flavor. And while I enjoyed it either way — with or without — the faintest dusting of poultry seasoning just before serving really ties together the flavors nicely. My kind of comfort food. In a small saucepan (2-quart), combine chicken broth and saffron threads (if using). Bring to a boil, then reduce to a simmer for the duration. While the broth warms, measure oil into a large sauté pan or stock pot (4-quart or larger) over just-shy-of medium heat; heat until shimmering. Add the onion, sauté until translucent (about 5 minutes). Stir in rice, cooking until the liquid is absorbed (1-2 minutes, do not allow rice to color). Deglaze pan with vermouth, cook until liquid is absorbed. Stir in about 1/2 cup of the hot broth at a time, stirring the rice mixture constantly. When the first batch of the liquid is nearly absorbed add another 1/2 cup broth; repeat with remaining broth. Once broth is used up, check rice for doneness (there should only be a little dot of white in the middle of a grain, tender with a little bite left, but not crunchy — very similar to al dente pasta). If the rice isn’t quite cooked properly, stir in 1/2 cup boiling water and cook until liquid is absorbed (if necessary, repeat until cooked). Once rice is cooked (described above), stir in pumpkin pureé. Add the cheese; stir until mostly melted (I like a few, small chunks remaining as a surprise/treat). If the risotto ends up too solid before you have a chance to serve it — it should still have some flow to it — stir in a little heavy cream or half and half to loosen it up a little (bonus: it will be extra rich and creamy). Season to taste with pepper and salt, and the faintest sprinkle of poultry seasoning (if desired); serve immediately.